Not an awful lot, as it turns out. But I did find a hilarious 1958 column by Bernard Levin, talking about end-of-year book-review roundups, and how preposterous they usually are (or were). Colin and Bill appear only as a kind of punchline; by this point they were rumored to be fascist fellow-travelers, and thus deserving of a sneer and a raspberry from all good-thinking hacks. The Literary Editor suggested that I take half a dozen books that would not normally have been reviewed at all, put them together and write round them a parody of all those dreary pieces that fill the Sunday Times and the Observer around Christmas-time in which T. S. Eliot says that the best book of the year, as far as he is concerned, was the sixteenth volume of Gschwandkopf’s Geschichte der Norddeutschen Wurstfabriken im Mittelalter and Colin Wilson says his favourites were Stuart Holroyd’s Shaw’s Mysticism as Exemplified in ‘You Never Can Tell’ and Bash ‘Em in the Teeth, the new (and as yet unpublished) novel by Bill Hopkins, whoever he may be. I thought this was rather a good idea, and said so. You’ll notice this also takes a swipe at T.S. Eliot (I see what you did there, Bernard Levin). So Colin Wilson, Bill Hopkins and their mate Stuart Holroyd are at least in excellent company. The real fun starts when he gets letters from authors and readers who take the reviews seriously. One of them is Barbara Cartland, all chuffed and fluffed to be praised by that nice Mr. Levin. I’m put in mind of this 1958 Spectator column as I assemble five titles I have read this year. Half the books I’ve read or thumbed through in 2018 were really wretched, in particular those that fill a specialty niche. Books about Harper Lee and To Kill a Mockingbird are hotter than ever, with each new title even more jejune and cliché-ridden than the last. Another big genre of bad books is what you might call Jewish Paranoia Nonfiction. 2018 brought us Fascism , by Madeline Albright (or rather, her ghostwriter), Tailspin  by Steven Brill, Suicide of the West  by Jonah Goldberg, Can It Happen Here? by Cass Sunstein , The Corrosion of Conservatism, by Max Boot, and many, many more, I am certain. These are just the ones I actually slogged through on Kindle or deep-skimmed during my visits to Barnes & Noble and the Amazon bookshop. Of course I’m not going recommend any of the foregoing. And to narrow my selection, I’m not going to list anything that I’ve previously reviewed or discussed in these enlightened pages. 1. Julian Jackson, De Gaulle (Cambridge, MA: Harvard University Press, 2018) . In most histories of WW2 and the postwar period, Charles de Gaulle is little more than a name and a (mostly) offstage presence. He sticks his head in briefly during the 1940 Fall of France, when he was a junior cabinet member, and then spends most of the next four years sulking in London. But now we cover this familiar ground with the General as the central character, and it’s refreshing and enlightening. He’s not quite as querulous and unpleasant as he’s usually depicted in popular histories . . . although he gets pretty close. 2. Ben Macintyre, The Spy and the Traitor (New York: Crown, 2018). I loved Macintyre’s book on Kim Philby and his circle a few years ago (A Spy Among Friends), but I hesitated to look at this one because it’s about a KGB double-agent I’d never heard of, and takes place in the 1970s and ’80s, which don’t much interest me. But I am here to report that this book is a real honey, at least as good as the Philby one. It paints a detailed background picture of KGB operations during the Cold War’s final blaze, when Yuri Andropov seriously believed Ronald Reagan was planning to level Moscow with Pershing II missiles. Our main hero is a KGB lifer named Oleg, who rises to the head of the London station right about the same time that—far away in Langley, Virginia—a CIA officer named Aldrich Ames decides he needs a lot of money. Ames sells a list of CIA/MI6 assets and double-agents to the Russkies for—one million dollars! Shortly afterwards, Oleg is suddenly and mysteriously summoned back to Moscow, where he’s subjected to interrogation, truth serum, 24-hour monitoring . . . and will most likely face eventual torture and death. This book has a happy, but white-knuckle ending: our spook gets smuggled out of the USSR via Finland in the trunk of a car. For years his British friends in Moscow have practiced an escape scenario, against the remote possibility that they’ll have to “exfiltrate” Oleg. The plan involves signaling with candy-bar wrappers, shopping bags, and funny hats; and a dirty disposable baby diaper figures prominently in the escape. If you saw all this in a Hollywood film you might sneer at it as hokum. But it’s all true. 3. 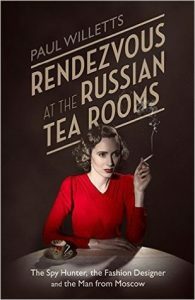 Paul Willetts, Rendezvous at the Russian Tea Rooms (London: Constable & Robinson, 2015). This is the story of Tyler Kent, Anna Wolkoff, Captain Ramsay and the others in the Right Club circle, in the months leading up to their arrests in London in May 1940. It’s strung along in novelistic fashion. This would probably be useful if you were trying to write a screenplay and needed a ready-built straightforward narrative, but I often found the character descriptions unconvincing and the “plot” a little contrived (even though, as I say, it’s a true story). I know Willetts has some basic facts wrong, but if I go into them here I’ll bore you to tears and sound like a conspiracy theorist. I read this in conjunction with some other books pertaining to the Kent/Wolkoff case, shortly after I’d been reading a lot about Louis-Ferdinand Céline  in the 1930s, including his ridiculous voyage to Hollywood to retrieve a girlfriend and get a movie made from his first novel. In this book it turns out that Anna Wolkoff and Céline were pen-pals (something I’d never come across before), and in fact the latter was planning to visit her on an upcoming trip to London. That trip to London was going to be in April 1940. But what with one thing and another, you know, it never came off. But it’s delightful to discover that Anna was corresponding with him right around the same time she and her crew were sending coded messages to William Joyce in Berlin. Just one big happy family! 4. David Halberstam, The Fifties (New York: Villard Books, 1993). Highly readable, not-too-breezy dissection of American political, social, and technological history from the latter 1940s to about 1960. This book bears very close comparison with William Manchester’s somewhat similar The Glory and the Dream (1973), but Manchester’s book was more concerned with fads, celebrities and nuances of etiquette (e.g., the artificial familiarity that became de rigueur after World War Two, so that you’d address near-total strangers by their Christian names). Halberstam here prefers to delve into such minutiae as the gossip and office politics that surrounded the development of the H-bomb. If that sounds dreary, and sometimes it is, it’s necessary background to the J. Robert Oppenheimer investigation, an early-’50s milestone that has always eluded me. Likewise Halberstam is very good at the describing the backwardness of American rocketry and the space program in the 1950s (we had the German rocket scientists, but didn’t do much with them till the Sputnik era). 5. Jörn Leonhard, Pandora’s Box (Cambridge MA: Harvard University Press, 2018). This is a hefty, mind-numbingly granular history of the Great War 1914-1918. It’s written by a German academic, originally published in German in 2014, and has only recently been translated into English. While the usual rule about World War One books is that they’re dense, theoretical, and argumentative (Paul Fussell’s The Great War and Modern Memory; Alan Clark’s The Donkeys; John Mosier’s The Myth of the Great War), Leonhard dodges that problem by basically treating the whole episode as though it’s never been written about before. Did you know a big war broke out in August 1914? Well it did! And here’s how it happened. Sometimes he gets bogged down in details (war-production economics are very big with Leonhard) but for most of this massive tome he’s very readable indeed. Or listenable. Many of the books I’m fond of, I have in both text and audio-book editions. This doorstop, however, I have only listened to on Audible, and I don’t think I’ve even finished that.